The Orobanchacea family of parasitic plants now contains many colourful and attractive wildflowers that were once placed, or some would say 'dumped', in a huge catch-all Figwort family Scrophulariaceae - the Cow-wheats amongst them. Field Cow-wheat (Melampyrum arvense) must surely count as one of our most beautiful of these wildflowers. 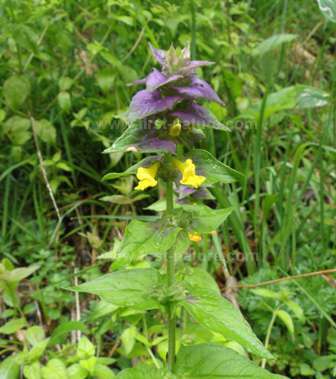 There are other beautiful cow-wheat species, however, and Wood Cow-wheat with its deep purple upper leaves and bright yellow flowers surely deserves to be high on the list. Seldom seen in the UK, where it is now restricted to a few locations in Southern England, this lovely wildflower is more easily found on the mainland of Europe. Wood Cow-wheat is found from Sweden in the north right down to Slovenia, where eight different species of Cow-wheats grow. Melampyrum nemerosum grows on woodland edges and on roadside verges, and it can usually be seen in full bloom throughout June and July. Melampyrum, the genus name, comes from the Greek words melas- meaning black, and -pyros meaning wheat. It is a reference to the fact that if seeds of a Melampyrum species are included with wheat or other grain that is ground up into bread-making flour then the resulting bread becomes discoloured (blackened). The specific epithet nemerosum means 'of the woods' - a reference to the kind of habitat in which this colourful cow-wheat is most often found.